Should architects, engineers and contractors give it away? By this I’m not referring to pro-bono work. Companies have a proprietary right to their property. Firms own their work and have the right to give away the copyright. Possession is, after all, nine-tenths of the law. Firms have a right to make a living. But not all firms can invest in R&D. What I take issue is with the word “proprietary” and the attitude it implies. At issue: a firm’s proprietary research and the outcomes of their research. At issue, as well, is their proprietary data. Big data in the AEC industry – with all of its potentially powerful benefits – won’t catch on and scale until the technology and data is freely shared. 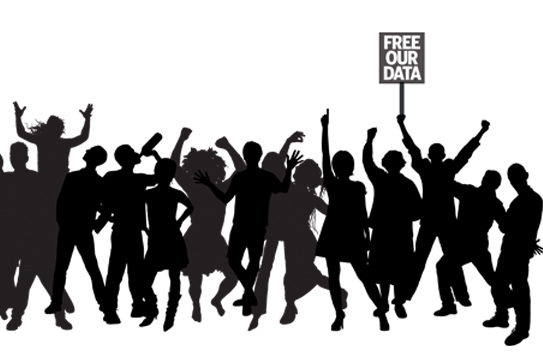 Information wants to be free – so why not data? What I am questioning here is the proprietary nature of sensors and other technology vs. open source big data and freely available technology. What if the architect were to measure the actual rather than simulate the predicted performance of material assemblies? How is knowledge of the environment acquired? What is the potential relationship between form generation and real-time feedback? How might design practices change when real-time feedback is incorporated into the design process? You can read the rest of the article Using Real-Time Climate Data to Drive Design here. There it is: proprietary i.e. proprietary sensor and communications technologies. Is it mentioned to ward-off would-be parties who might be interested in using the sensors for their own gain? But isn’t the point of using the sensors and related technology and data to improve the environment and related performance? The idea of giving away something in order to gain something isn’t new. It’s the subject of Chris Anderson’s recent book, FREE: How Today’s Smartest Businesses Profit by Giving Something for Nothing. The irony – perhaps a taste of his own medicine? – is that Anderson’s book is available for free. In the AEC space, Wikihouse and Paperhouses give away building designs and plans for free. In fact, concerning Paperhouses, Metropolis Magazine and ArchDaily’s Vanessa Quirk asks: Will Open Source Democratize Architecture? In the data space, Jeff Heer, Assistant Professor at Stanford and creator of four data visualization toolkits/languages: Prefuse, Flare, Protovis, D3 that are freely available for all to download and use. Catch a greatpodcast with him here at Data Stories and read about Heer here. Just as the expansion of open source data is important for reaching scale with such technologies as augmented reality, so too making sensors, communications technology and data available for all to access freely is critical for big data in the AEC industry to scale. Until technologies for capturing, analyzing and applying data are forever open, clear and free, the construction industry will continue it’s 60-year plus decline in productivity. Little to Lose and Much to Gain? This is true as well for students, professors and architects who spend a lot of time researching and developing technologies and the resulting data. If these were to be open source, freely available for any professional to download or acquire and use, what would be lost? be unable to regain the money they invested in the research. lose the opportunity to make a profit and fund future research. potentially lose clients who might feel used, especially where the firm conducted research on the client’s dime. lose their exclusive right to the data and technology. lose the right to call them proprietary sensor and communications technologies. Despite there being much to lose, if otherwise proprietary data and technology were made available to all, so much would be gained – for the profession, industry and especially the environment. AEC firm’s data- and technology-related research can of course be supported by sponsors and grants with much to gain. How do firms then fund their research? If they do so through the results of their research, then can they afford to give their work away? If the firm’s research is sponsored or subsidized – firms can then afford to, but may not be able to – give their data and related technology away if their sponsor has a claim of the research. And yet, nothing would have changed had the technology been freely available to not only the students, but to others as well. To gain the advantages offered by data in the AEC industry, firms need to agree to and define an open data and technology strategy. Do you agree?